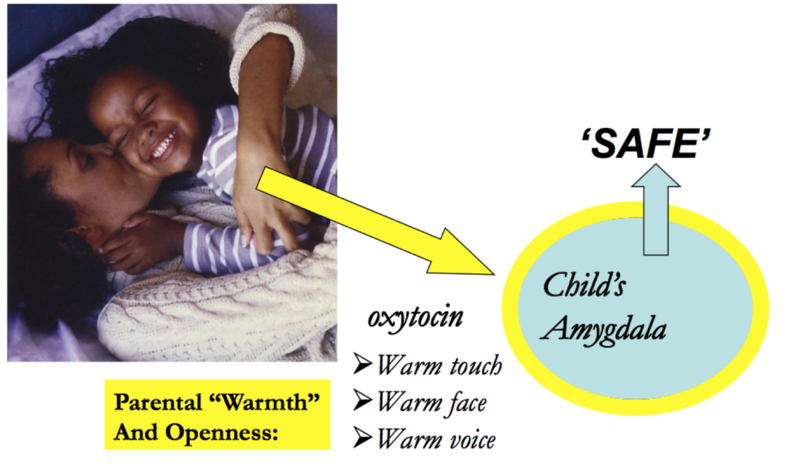 As infants when we have healthy attachment interactions with attuned, consistently available, nurturing caregivers this lays the foundation for the optimal development of our brain and nervous system. Over time this co-regulation (assisted regulation) allows us to learn how to effectively auto-regulate (self-regulate independently). "Window of Tolerance" a term coined by Dr. Dan Siegel is now commonly used to understand and describe normal brain/body reactions, especially following adversity. The concept suggests that we have an optimal arousal level when we are within the window of tolerance that allows for the ebb and flow (ups and downs of emotions) experienced by human beings. We may experience hurt, anxiety, pain, anger that brings us close to the edges of the window of tolerance but generally we are able to utilize strategies to keep us within this window. Similarly we may feel too exhausted, sad, or shut down but we generally shift out of this. Below is a diagram demonstrating the ebb and flow of an optimally regulated nervous system experiencing activation followed by a settling. ​​When we experience adversity through trauma and unmet attachment needs this can drastically disrupt our nervous system. Our senses are heightened and our experiences and reactions are typically intensified and strategies are less readily accessible to us (see blog post on flipping your lid). Adverse experiences also shrink our window of tolerance meaning we have less capacity to ebb and flow and a greater tendency to become overwhelmed more quickly. Learning how to track and shift our affect can be a powerful tool for promoting regulation and integration throughout the brains, body, and mind. Regarding arousal states: hyperarousal, calm arousal, and hypoarousal. Calm arousal is the ideal state and that most times during the day we fluctuate within various levels of calm arousal. However, when we become to over-stimulated (fear, pain, anger, trauma triggers etc) to the degree that it pushes us outside of our window of tolerance this is hyperarousal. Hyperarousal is characterized by excessive activation/energy often in the form of anxiety, panic, fear, hypervigilence, emotional flooding etc. This keeps our system stuck on on and impacts our ability to relax, often making it difficult to sleep, eat and digest food, and optimally manage our emotions. At the most intensified level this may result in dissociative rage/hostility. Hypoarousal may occur when we have too much hyperarousal, surpassing the pain/emotional overwhelm our brain/body is able to tolerate, causing us to plunge into a state of hypoarousal (shutting down or dissociating). In this state our system can become stuck on off characterized by exhaustion, depression, flat affect, numbness, disconnection, dissociation etc.This too impacts our sleep in that we may want to sleep all the time, this impacts our appetite and digestion as well and may make us feel emotionally deadened. What I have observed however is that as human beings we only have capacity to state in one state for so long before the brain and body shifts us. For example, we can only tolerate so much pain, anxiety, fear etc before the brain and body respond and numb us to this excessive energy. Similarly people will only stay in a shut down state feeling emotionally deadened inside before the brain/body shifts us out of this often by gravitating towards (often subconsciously) things that make us feel alive. This could mean that we gravitate towards high risk behaviours or activities uncharacteristic for us to bring about that sense of excitement, activation, and vitality. Essentially we are self-preserving as there is some part of the brain / body that is not ready to be dead yet. Many people will share that they "don't feel right", "are crazy", "messed up" etc. The know that they don't feel okay but without having experienced regulation in infancy and childhood or following unresolved traumatic experiences that remain activated in the brain and body people may grow up in a manner that they don't know how to self-regulate. Instead, people often attempt to self-regulate and bring themselves into an optimal/calm arousal level any way that they can, without even knowing this is what they are trying to do. For example someone with excessive fear may gravitate towards a depressant to calm their brain and nervous system whereas someone feeling emotionally deadened may gravitate towards a stimulant to make them feel alive. Understanding the function of how people are responding and what may be needed to effectively shift this emotional state is critical for finding effective strategies to shift arousal that don't lead to further harm to self or others or leave the individual with a sense of shame. This can be referred to as a false refuge in that it provides the "illusion" that it is helping but in the end the problem is still there and maybe even bigger and now we have layered on shame, guilt, a sense of failure etc., as we have responded in a way that we didn't want to. A "true refuge" is something we do for ourselves that effectively allows us to shift towards our optimal arousal zone while building competencies and taking care of ourselves in a manner that feels good. Parents, loved ones, and teachers/staff can help by identifying and labelling (making observations based on how children are presenting) “It looks like you are feeling overwhelmed, why don’t we take a break” etc. Dan Siegel refers to this as "name it to tame it". Naming it allows for a sense of understanding and being seen as well as validation. When we stop to notice (within ourselves or others) this can be a powerful grounding tool. Children, youth, and adults should be encouraged to focus mindfully on noticing how they feel, how their body feels, and identifying what they need to feel right again. Our goal is to essentially broaden this window of tolerance increasing capacity for people to hold emotional experiences (even intense ones) without become dysregulated or going into a state of hyper or hypo arousal. Below is a great visual by NICABM to help understand this concept. When we understand where people are within this window of tolerance it allows us to target treatment or teach them and their loved ones skills and strategies to effectively promote affect regulation. The function of the behaviour is important to understand with compassionate curiosity. For example, for the person who is self harming are they self harming because the pain they feel is so intense that the self-harming behaviour is the only thing that provides release, or are they doing so because they feel so emotionally deadened that they self-harm to feel alive. This can help to effectively target treatment. If we have too much discharging the excess energy and intense emotions ​will often help to shift things, think about it...this is precisely what happens when intense emotions build then explode out of us through conflict or chaos. There is a release of the emotional build-up but it is messy and harmful for us and those around us. Instead learning how to effectively release these intense emotions can be helpful. Similarly if we are feeling shut down using strategies to optimally stimulate our brain and nervous system in a healthy and empowering manner can shift us out of this state in a away that feels good for us. I have included some sample interventions below, but again these are general strategies. Those unique to the individual will have the greatest efficacy. Often these can be discovered in therapy as well, at ATTCH we train therapists all over the world to learn how to deliver trauma-specific integrative treatment many other professionals are also providing training in these areas and as such the amount of therapist providing integrative trauma treatment is growing regularly. Some examples for shifting arousal levels are included below. The key is figuring out what works and when. At times some activities may be down regulating / grounding while at times the same activity may be stimulating. Try different things and find what works well for you. Practice strategies when you are calm and on a regular basis, this will build your capacity to access these when you start to become overwhelmed. If introducing activities to a client or loved one, it is important to monitor the affect of the individual you are working with and request feedback from them to notice how they are feeling. Anything that stimulates the senses! Do not engage in behavioural and cause and effect approaches (i.e., if you do this then…). These are higher function, left-brain responses and not something they are capable in the moment, rather this is likely to result in increased escalation. In summary learning how to shift your arousal level, the arousal level of your loved ones, or those you work with can be a powerful tool for promoting integration and building competencies. It can also lead to feeling more comfortable in ones own body and more confident in the ability to manage emotions and maintain relationships. If you are a seeking to learn more about becoming trauma informed or providing trauma specific treatment please see our certification and training section to learn about upcoming events. Wishing you and yours a gentle rest of your day!